On Saturday, APD Dumfries won their Scottish Cup game at Falkland by 4 wickets by successfully chasing the home side’s total of 150 all out. Jerry Goodin and Manson Associates Man of the Match Peter Lojszczyk each took three wickets for Dumfries. Several in the batting line-up then made contributions. Chris Bellwood scored 35 and Robert McBride 29 in the winning Dumfries total of 157 for 6 which was reached with over six overs left. The side play their final group game against Heriots at home on Saturday. 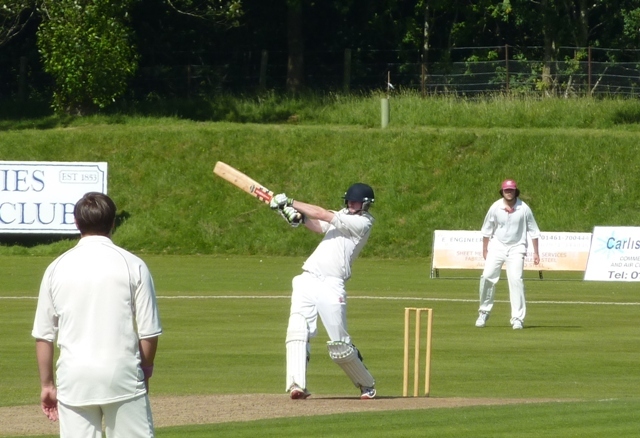 Also on Saturday Ego-Genics Nunholm won their Western Cup game match against Galloway by 8 wickets. Alan Davidson dictated the course of the match for Nunholm with five wickets to help have Galloway five down early in their innings. Damien Brown responded by hitting 49 for the final Galloway total of 153 all out. Then the JKC Engineering Man of the Match, Alan Davidson, with 54 and Davie Davidson with 50 not out took Nunholm past that for the loss of two wickets. In the CSL40 Cup at a sunny Sunday at Nunholm a young Dumfries side lost out to Renfrew. Professional Said hit a century in the visitor’s total of 211 for 9. Cairndale Hotel Man of the Match Peter Lojszczyk finished with a five-for. A sixth wicket partnership between Chris Bellwood (50) and Alan Davidson (35) kept a win possible but the side were finally all out for 173 with five overs left. Dumfries’s Niall Alexander travelled with Scotland u17s to the Netherlands for a 3-game tour this week and Rachel Howard returned from playing with Scotland Women U17s in their games against County sides last week. Summer Junior Cricket: A Club 2-day summer camp is taking place at Dumfries Sports Club, Nunholm, on Thursday and Friday, 18/19 July (10-3), for boys and girls (Age 7-16, £25 for 2-day camp). Suitable for beginners, to book a place, or for details, contact the Club on dumfriescricketclub@gmail.com or 07799 856094, www dumfriescricketclub.co.uk, @dumfriescricket. Club junior coaching sessions also continue at Nunholm each Monday for the summer from 6:15-8pm.